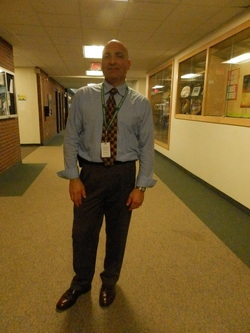 When Mr. Paul Penna, our new school principal, greeted students on the first day of school, he was wearing the school colors, green and white. From day one he has encouraged students to show their spirit. He says the success of the football and the girls’ cross country teams, along with the great support of the cheerleaders and the band, have helped unite the school. That’s just one of the things that Mr. Penna, who previously worked at high schools in Portland, Oxford Hills, and Gray-New Gloucester, is working to improve at Bonny Eagle. Mr. Penna says that he was interested in coming to Bonny Eagle High School because he saw that the district was trying to move in a different direction through standards-based grading. He also liked the superintendent's goals, and wanted to help our school get closer to achieving them. Without getting into specifics, he said that he thinks our school structure is very outdated and there are some “holes” in the curriculum that don’t fit the needs of students who are graduating today. “We need to move into the 21st century and get rid of these old fashioned things,” he said. Mr. Penna describes himself as being “very social” while growing up and very active in high school. He said he knew everyone in his neighborhood along with people in the surrounding neighborhoods, even the garbage collectors and mailmen. He played the trumpet in the school band and considered himself a “band rat.” He also played for the first organized uniform soccer team for Portland High School. “I still have the uniform because I never turned it in,” he says. Before becoming an administrator, Mr. Penna worked at the Windham Correctional Center and with the South Portland Police Department. He decided he wanted to work with kids, so he went back to school to become a guidance counselor. As an educator, he says he has seen some pretty crazy things. Students have brought hits of acid in gum wrappers, and guns with no bullets into his former schools. But these things are rare, and the scariest thing for teachers is losing control of a class. He has had some teachers ask him to come into their classrooms to help them regain control. Some fun facts about Mr. Penna include that he owns a 2004 Dodge Ram and a 1998 BMW Z3 (that he calls his midlife crisis.) He says his wife calls him cheap because he doesn’t like going out to eat, preferring to put on his chef’s hat and try out new recipes at home. “She calls me cheap; I call it frugal,” he says. One thing about BEHS that impresses Mr. Penna is the “working community” that is doing its best to embrace the many changes so far this year. While there is a timeline for accomplishing the district’s goals, he cautions that people need to work at a pace that makes sense. Mr. Penna’s advice for students is not to be afraid to try new things. As his own experience, shows, it can open doors and lead to new experiences. “In order to grow and learn you have to take on new challenges,” he says. “The best learning you can have in your life is going and doing something you don’t know how to do."